Hello PISO FARE friends! Here is another round of Air Asia promo fare 2016- 2017! This time, sale tickets of Air Asia Philippines are divided in 2 categories a) Travel from October 25 to January 8, 2017 with specific promo ticket prices, b) Trips from January 9- June 18, 2017 with 20% off on base fare. Book your Air Asia promo ticket until October 30 and indulge on your last 2016 quarter adventures to your desired destinations. For this Air Asia promo, the lowest fare is for Boracay (via Kalibo) to Manila for as low as P803 for one-way travel. 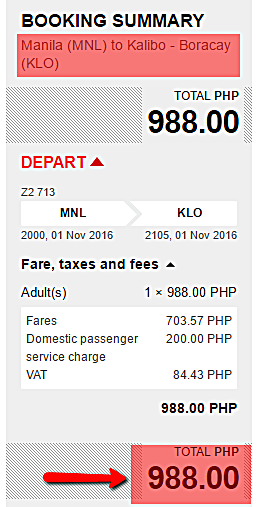 Manila to Boracay will cost you P988. The 2nd Air Asia promo is the 20% off on all base fare to all destinations for travel from 9 January 2017 to 18 June 2017. The details on this promotion is mentioned in the later part of this post. If you want to get the Air Asia lowest fare, book your seat flights fast! Sale tickets are limited! This Air Asia promo allow clients to enjoy up to 20% savings on base for all destinations of Air Asia Philippines routes. Booking of your Air Asia sale tickets can be done at www.airasia.com. Another way of getting the Air Asia low fares is by reserving your ticket on mobile.airasia.com (booking thru AirAsia Mobile App for iphone and blackberry users). Or, you may buy your promo fare tickets at Air Asia Sales Offices, Airport Sales Counters, authorized Travel Agents and Kiosks in selected locations and airports. Booking and purchasing your tickets online is possible even if you have no credit cards. Click HERE on how to pay your tickets without credit card. For more promo fares, PISO FARE and travel updates LIKE and FOLLOW us in Facebook at PISO FARE TICKETS!! !